Lauren Battung scored a goal in the 60th minute of Cal’s win. It was the junior forward’s second goal of the season. Sunday afternoon’s crowd at Edwards Stadium witnessed a thrilling match by the Cal women’s soccer squad, which pulled off a stunning 2-1 victory in overtime against San Diego State. After a late second-half goal by Aztec Cat Walker forced the game into OT, Cal senior forward Katie Benz became a hero with her game winning, sudden death goal. In a scrambled play inside the box, Benz took the shot that might have saved the Bears (1-1) from beginning their season 0-2. Similar to Friday’s game against Pepperdine, Cal managed to outshoot its opponent in the first-half (9-2) but was unable to complete its opportunities as the game remained scoreless after 45 minutes. The offensive break needed would come soon after. After receiving a long cross-field pass from senior defender Daniele Brunache, junior forward Lauren Battung took advantage of her one-on-one opportunity against SDSU goalkeeper Rachel Boaz. Battung’s goal gave the Bears a 1-0 lead with 30:18 left in regulation. 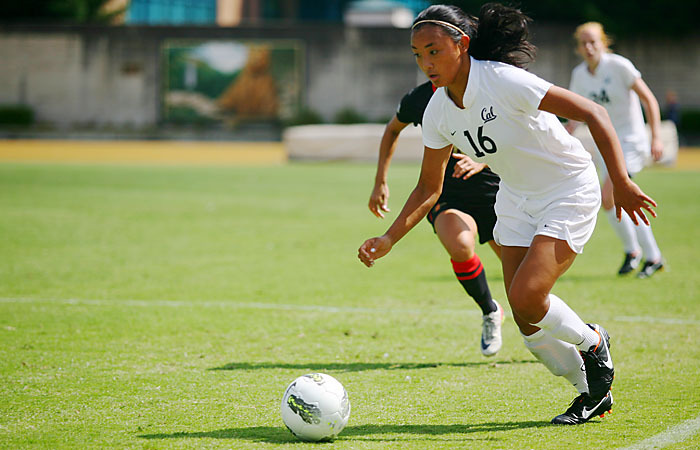 Battung has scored a goal in all three games played this season (including the 4-1 exhibition win against Fresno State) and is quickly become the central focus of Cal’s offense after losing superstar Alex Morgan. After 85 minutes, the Bears appeared to be in control and headed for their first win of the season due in part to the efforts of defenders Brunache and Emi Lawson. They managed to keep the Aztec’s best scorer, Walker, in check for most of the game. “Both Emi and DB are strong central defenders and they can generally handle most forwards,” McGuire said. With 4:31 left in regulation, Walker — the 2009 MWC Offensive Player of the Year — would manage to escape her pesky defenders and tie the score to send the game into extra period. McGuire acknowledged his defenders’ efforts as well as the offense of San Diego State (1-1). “I think for most of the game we were able to quell their offense although the last 10 minutes of the second half, they certainly got good opportunities and deserved the goal they scored,” McGuire said. A frustrated Cal squad returned to the field for overtime but managed to quickly end it with Benz’s exciting game winner in the 95th minute. “I was really angry after regulation but I’m just really happy for this team, that we were able to pull it out,” Battung said. The Bears now head to Hawaii to play North Dakota State on Friday, Aug. 26 and University of Hawaii next Sunday.